The present sign is made from aluminium and was unveiled in April 2008. 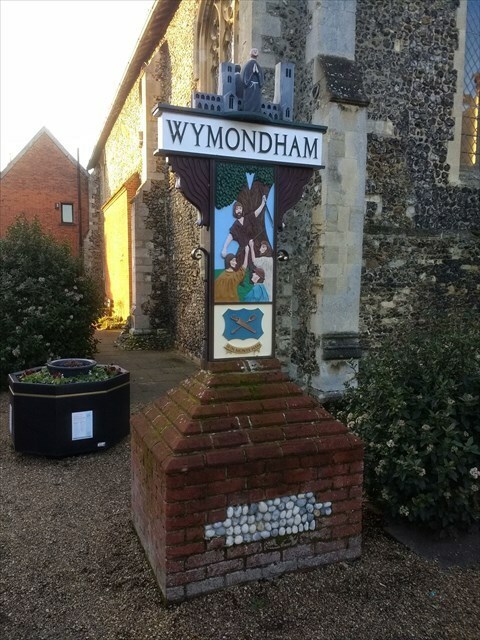 This replaced an earlier sign which had suffered the effects of weather and time, which had been erected in 1969 by the Wymondham WI to mark their Golden Jubilee. The sign depicts a number of local notes of interest, including Ketts' Rebellion and the Abbey. The crossed spigot and spoon represent the town's wood turning history. The cache is not at the given coordinates, which are for the sign itself. To find the cache, study the sign and answer the following questions to get the letters you need to substitute into the final coordinates, which are N 52° 34.ABC, E 001° 06.DEF. A = Number of buildings depicted. B = Number of sticks being brandished on the panel depicting Ketts' rebellion, multiplied by two. C = The number of two dimensional characters on the sign. D = At the bottom of the sign is the Saxon name for Wymondham, which is in three parts. Add together the number of letters in the first and last part. E = Number of tools (or possibly carved spoons) on the wall behind the woodturner. F = Number of courses of brick in the sign's base (don't count the courses of sloping bricks). Final is a short walk away. It is in a residential area so please respect their amenity and privacy while retrieving and replacing the cache. PLEASE NOTE the magnet will only stick to the circular bit of the host, not the flat part. The cache will fall off otherwise!